Has Australia Got a “Far-Right” Problem? Taxpayer financed ABC Fake News journaille insist that we do. For them, it’s not African savages who are terrorising the natives; it’s the dastardly “Far-Right”. Freedom of expression comes first.. Strange that anyone who stands against stupidity is called a racist. Public areas are not for gang gatherings of mono cultural groups…blacks do not have more rights than Asian or whites…just as whites or asians have no greater rights than blacks. These people are out of control. Time to send them back or move them to other areas of Australia in small family groups. Hell no. Do not distribute them around the country. Even in small family groups they cause the same problems. Apparently videoing in a public place is a crime in Victoria! 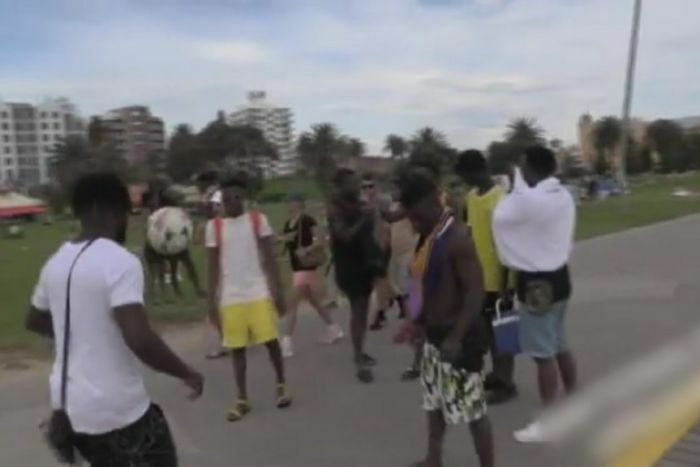 Victoria’s Police Minister has warned the community against inciting violence after far-right activists filmed a group of men playing soccer at St Kilda Beach, refusing multiple police requests to stop recording. “I’m allowed to film, mate, don’t touch me … it’s a public area mate, you can film where you want,” one of the activists can be heard replying. The activists refuse to stop filming, and one can be heard saying “I’m just filming, it’s a public area, I’m legally allowed to film”. 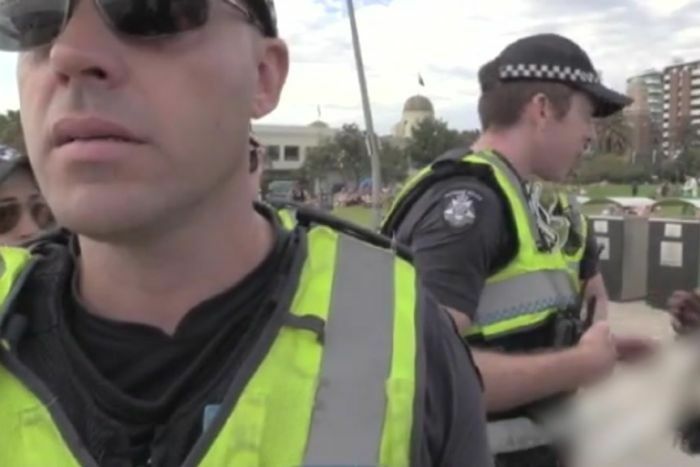 Victoria’s Police Minister has warned the community against inciting violence after far-right activists filmed a group of men playing soccer at St Kilda Beach, refusing multiple police requests to stop recording. You can count on the Propaganda arm of the Sharia Broadcasting Service to turn any non white criminal into an under privileged victim of racism and to blame all regular Aussies for African crime gangs. Police have decried “racism” behind an altercation at St Kilda beach. Racism may not make us any safer but then again neither do the cops in Victoria. What say you? Residents and traders in Melbourne’s north-west are threatening armed retaliation, fed up with months of violent attacks on shopkeepers. Police are warning the Vietnamese community of St Albans against taking vigilante action. Interesting. The police is threatening the victims and protects the criminals. Sounds like a plan. Victoria Police will double their numbers at Melbourne’s Chelsea Beach tonight after five people were assaulted in the area in a string of violent incidents last night. Fred Kerbagh, a local business owner, described the violent night as “just really really bad”. “These guys have got no respect for anyone,” Mr Kerbagh said. The offenders are of African appearance and are aged in their late-teens to early-20s. A video of the incident posted on social media by far-right activist Neil Erikson — who last year approached former Labor senator Sam Dastyari in a pub and called him a “terrorist” and a “monkey” — shows footage of young men playing soccer on the St Kilda foreshore around 5:30pm on Friday. “Can you stop that?” one of the group of around 15 people being filmed asks the activists three times, before another member of the group attempts to push the camera down. “I’m allowed to film, mate, don’t touch me … it’s a public area mate, you can film where you want,” one of the activists can be heard replying. “What are you recording us for?” one of the young men asks. Some members of the group of young men can also be seen attempting to defuse tensions. Police officers then moved in to separate the two groups, and can be heard repeatedly asking the activist group why they are filming and requesting that they stop the recording and move on from the beach. The activists refuse to stop filming, and one can be heard saying “I’m just filming, it’s a public area, I’m legally allowed to film”. Shortly afterwards the video shows a scuffle between one of the men from the soccer-playing group and officers, and the activists can be heard saying “yes, yes, yes” and running towards the altercation with the camera. Capsicum spray is used and the man vomits as he is held on the ground and arrested. The incident at the St Kilda foreshore comes a day after several beachgoers at nearby Chelsea Beachwere robbed and a man smashed in the head with a bottle by a group of young people. “Contempt” is a rather phoney conviction. Mohammedans who got children to behead their stuffed toy animals in a mosque were not convicted for ‘contempt’. 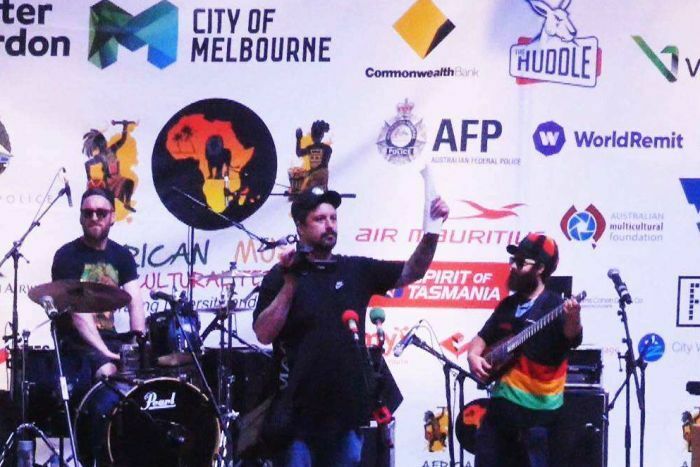 Earlier this month, he gatecrashed the microphone on the stage of an African music and cultural festival at Federation Square in order to declare “it’s ok to be white” — a phrase commonly used by white supremacists. It is also not the first time Mr Erikson has confronted people from racial minority groups in Australia with a camera. Last year, he called former Labor senator Sam Dastyari — who was born in Iran — a “terrorist” and a “monkey” when he filmed him without his consent in a Melbourne pub. Sam Dastyari is a crook and corrupt to the core. Why was he never taken to court for his transgressions? Racism may not make us any safer but then again neither do the cops in Victoria or any of our politicians..
Victorian Police Minister Lisa Neville praised police on their response to the incident, and warned that “racism itself does not make any of us safer”. Obviously, this is not about skin pigmentation. Its about African savages behaving like mad monkeys and committing crime after crime against native Aussies. “People who attempt to incite — whatever their background — incite violence … should be held to account by police and the law,” Ms Neville said. Why not go after the African gangs who actually commit violent crimes? “I want people to let police get on and do their job of keeping our beaches and our streets safe, which they do a great job of. Lock the Africans up then. Or ship them out and back to whence they came from! A Victoria Police spokesperson said no other people had been arrested or charged over the incident. Black African migrants (also know by the PC title of African/Australians) are destroying the Australian family beach culture by attacking and terrorising innocent people. They move in gangs, bashing people unconscious, then steal their phones, money and any valuables they may be carrying. They are protected by police who often blame the victims, and if arrested, are then protected by the courts when they are let out on bale to do it all again without censure. But, it looks like Australians have had a gut full and are planning on doing what the police are incapable of doing….protecting innocent families who just want to go to the beach, have a swim and have some summer fun.